Pull on pet bathing gloves to make bath time easier. There’s no rinsing needed and no soapy residue left behind. Add a little water, scrub, and towel dry. The mitts have a gentle formula that’s hypoallergenic, pH-balanced, and fragrance free. One mitten can clean all of your pet, or you can use it for touch-ups—like on dirty paws after a walk. Dimensions: 8" x 1" x 13"
Scrubby pet bath mittens come from folks used to creating goods for humans. But Zevi Wolmark and his team thought, why not try to make bathing a dog easier and less stressful? They eliminated the tub—and the running water—to make a simple but smart way to clean up dirty pets. The pre-soaped mittens are made with a gentle formula that is hypoallergenic, pH-balanced, and fragrance free. 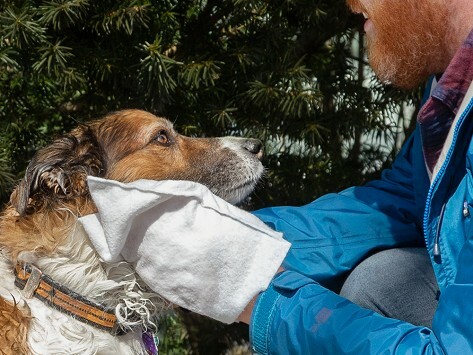 Add water to get a mitt to suds up, but not to rinse your pet—there’s no rinsing or soapy residue here. Just a cleaned-up pet. Use the mittens to give an animal a head-to-toe clean or reuse them for touch-up jobs. We think they make a great addition to the trunk or mud room to give dirty, sandy, or snowy paws a quick once-over.